I hope you are all having a great Sunday. Tomorrow is bank holidays where I live which is great. Even better is that tomorrow I will be flying to Rome for 5 days. The posts during this period might get a bit sporadical. I prepared a few but I don't know if I will find time to edit and post. And for tonight, I have to yet pack. I am an extreme last minute packer. You can see me throwing in stuff minutes before leaving the house, lol. 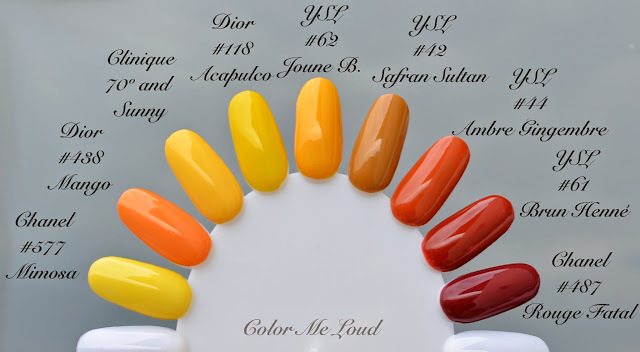 I have the nail polishes from YSL Summer Collection for you today. I started feeling out of love with the brand recently. It is mainly due to the reformulation of their eye shadows, the fall out in their new 10 shades palettes and finally how things are going at the backstage of this blog which doesn't motivate me to post more YSL either. This is how I passed on the limited eye shadow palette from Summer after swatching at the counter. It is tones of brown. Their new eye shadow formula blends way too easy into each other. I think it works much better with shades which are not all that close (such as the one from last Summer which I reviewed here). This year's palette had very close colors across the product, hmm, no thanks. And it was more expensive than regular palettes although the packaging was regular. Why? The nail polishes though, I had to have them because first of all I (still, somewhat, don't know why) collect them. And... both are very interesting shades which look like no other in my stash. And that is really hard. 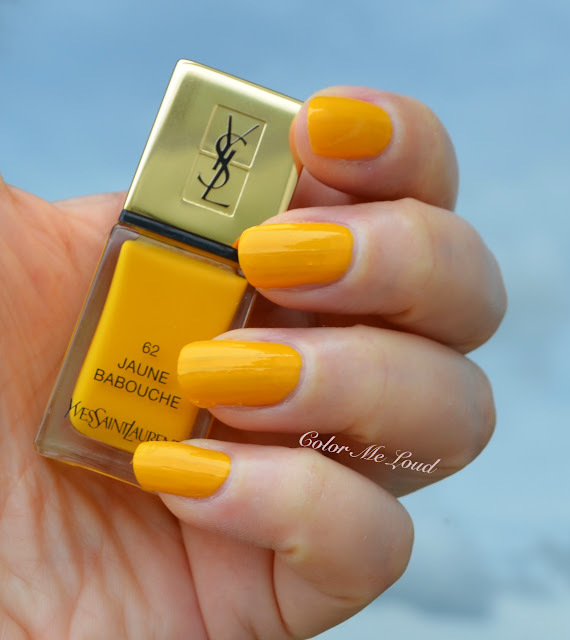 YSL La Laque Couture #62 Joune Babouche (for the meaning of this, check out SandraVB79's comment below) is a very warm almost orange yellow. When I posted this at Instagram, I was told it is like a yellow marigold color, which is exactly what it is. This one has a good consistency. Yellows are usually tricky but this one is surprisingly not streaky. Below you can see it in two coats. I wore this shade for 4-5 days, it lasted long and it was more wearable than I thought. The other shade is a red... How original can a red be right? Well, to my surprise I don't own something like this one either. 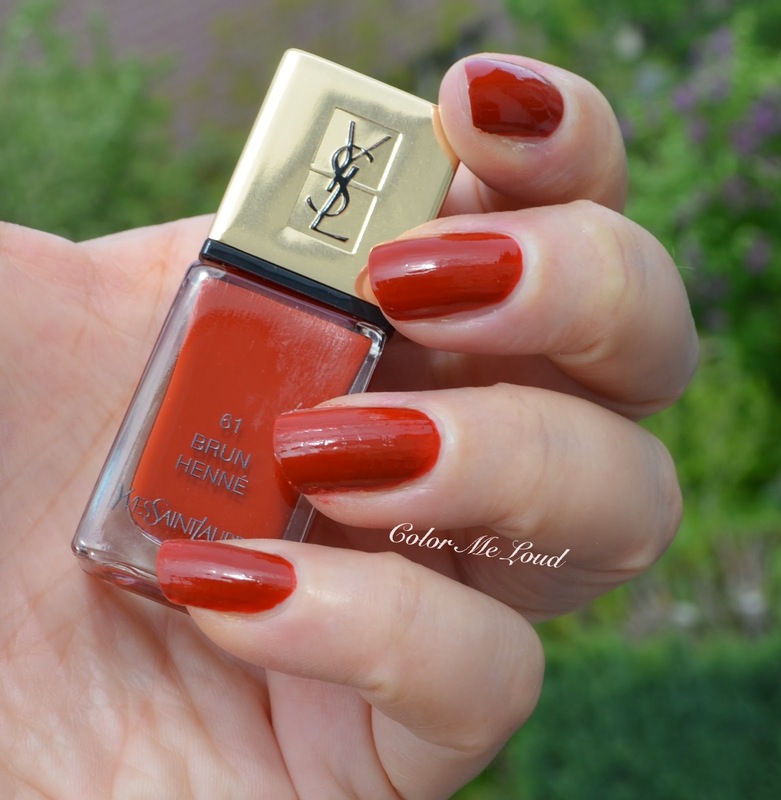 YSL La Laque Couture #61 Brun Henné is a very warm, almost brownish red which is not too dark. The formula is great, a little thin but it is opaque in two coats. This one looks really pretty on my skin color/undercolor combo, although I didn't really think it would. It has cream finish, below you can see it applied in two coats. I tried hard to find similar shades but I failed. The closest shade to #62 Joune Babouche is Clinique 70º and Sunny. Dior #118 Acapulco and Chanel #577 Mimosa are both cooler, Dior #438 Mango is more orange, YSL #42 Safran Sultan from their hard to find Spicy Nails Collection is more brown. #61 Brun Henné resembles Ambre Gingembre but more red, it is more brown than Chanel #487 Rouge Fatal which is one of the warmest reds I have. 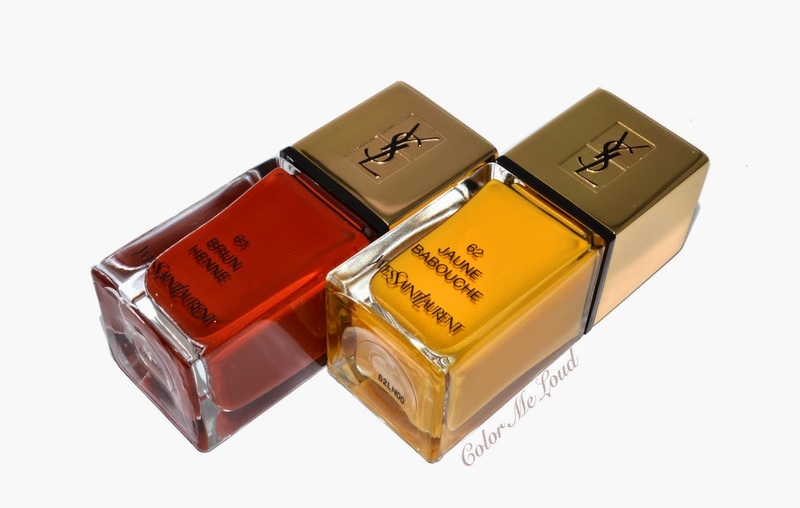 Final thoughts: Although they don't scream summer to me, I like both of the nail polish offers from YSL's Summer Collection. #61 Brun Henné and #62 Joune Babouche are both wearable and unique to my collection. The consistency is great too. If you like warm shades, I recommend you check them out. Do you own any similar shades to those? I have a lot of red browns and could probably dupe Brun Henne. And I have this weird attraction to strange yellows even though they are not always that wearable. I have an electric yellow holo from CBL and an ochre from Rescue beauty Lounge. So I am drawn to Babouche. Have to go to swatch it at Sephora or something. wow I had never really thought about yellow nails but you are rocking them! Love it! Oh these colors reminded me of their Spicy Collection from 2 summers (?) back.... but i'm glad Brun Henne isn't like Ambre Gingembre! That macdonald's yellow is lovely!!! Did you pick up any of those tinted top coats too? Have fun in ROME!!!!! I'm soooooo jealous! I need picts of hot Italian men! I appreciate the point of difference with these two colours, but they are just not colours I would gravitate towards during any season lols. Wow, Rome!! Hope you have an amazing time, and yep, I pack just like you. Last minute queen over here! Jaune babouche doesn't exactly mean yellow slippers, but slipper's yellow. Babouches, the Moroccan slipperds, usually come in a very distinct yellow (at least all my neighbours have them in that yellow), the yellow from the nail polish. Yelow slippers would have been "babouches jaunes". I have been looking at the yellow one since they came into my local store, still lusting after it and may just have to buy it! Hi Alison, I would be super excited to hear what shades come close to this one. I have like all the reds from Chanel, Dior, YSL and many more. Nothing comes close. LOL I know yellow on the nails is a bit strange but I wore that polish over days and eventually you get used to it ;-) I even liked it! Hey Sara, hmm I only own two yellow nail polishes. One is the Givenchy spring one and the other is Dior Sunwashed. Sunwashed is obviously too washed-out to be similar to this yellow, but the Givenchy one MIGHT be similar. Absolutely nothing like Brun Henne tho! thanks so much for the explanation. I really appreciate it a lot. I am going to edit the post and correct it :-) I didn't know there is a strictly yellow slipper in Morocco, it is a gorgeous color! It is really a nice pop of color for summer. yeah that Givenchy Spring shade might really be close. Bruno Henne is interesting. It doesn't look like any red in my collection and it is more wearable than very warm browny reds I have. Fun color! They exist in other colours too, but I think the yellow is the most "authentic"? I have seen them sold in many colours, but whenever my Moroccan neighbours are in traditional dress, they wear the yellow ones. Wow! I love them! Thanks so much for the photo! So fun!